The Royal Government of Bhutan encourages all tourists to travel in groups. 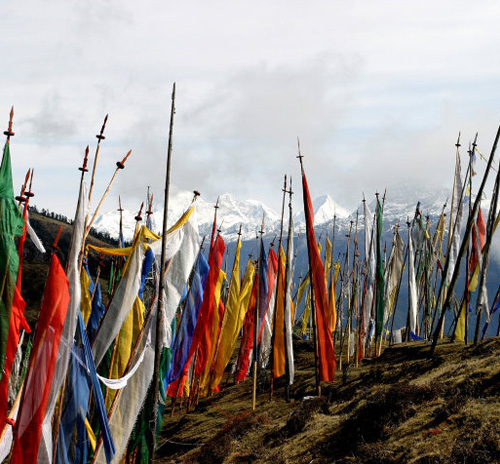 You can book a package holiday to Bhutan through both international and Bhutanese local tour operators. The visit must be preplanned, prepaid, and guided. It can either be a guided package tour or a customized travel plan. There is no restriction on visitor numbers. Remember that independent travel is not permitted in Bhutan. High Season Tariff – US$ 250 per person per night halt ( February, March, April, May, August, September, October, November and December). Low Season Tariff – US$ 200 per person per night halt (January, June, July). The rates are applicable per tourist per night halt in Bhutan. On the day of departure, the local agent’s host obligation shall be limited to breakfast only and any extra requirements shall be payable on actual basis. The rates apply uniformly irrespective of locations and the type of accommodation provided/asked for. This minimum cost can vary depending on the size of the visiting group, season, duration of stay, and your itinerary. You will have to pay separately for liquor, beer, mineral water, bottled soft drinks, laundry, and Bhutanese hot-stone bath. Individual travelling (with a guide, of course) is common, but comes at a higher tariff rate. Individual tourists and couples are subject to FIT (foreign independent travelers) surcharge, over and above the daily rate. The surcharge is US$ 40 per night for one person and US$ 30 per person per night for a group of two people. The 10% agency commission payable to agents abroad shall not be deductible from the surcharge. There is no charge for children up to the age of five years. However, those between the ages of 6-12 years accompanied by elders/guardians shall be given 50% discount on daily rates and 100% discount on Royalty. Full time students under the age of 25 must produce valid identity cards from their academic institutions to be eligible for a 25% discount on daily rates. A discount of 50% on daily rates is given to one person in a group of 11 to 15 people. 100% discount is given to one member in a group exceeding 16 persons.